WILLEMSTAD - In preparation for the Curaçao Pride 2018, which traditionally takes place in the last week of September, the organization is present this week during the Amsterdam Pride. 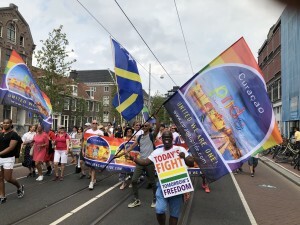 To promote the Curaçao Pride there is a nice delegation with colorful flags and banners and an original Curaçao brass band of 16 musicians to draw attention for the Curaçao Pride. “We are very happy to be invited at the Amsterdam Pride to promote the Curaçao Pride. As we get more and more international visitors it is extra important to promote the Curaçao Pride abroad. Our presence this week in Amsterdam is very well received and we notice that there is much enthusiasm to visit the Pride on Curaçao. This is also in line with our expectations, given the annual increase in visitors from all over the world. "